On Facebook recently, Alina’s mom, Marie, wrote a long, transparent, heartbreaking post about some of the difficult things she has had to walk through in her life. (Alina was one of Jason’s best friends and died in the accident with him.) She talked about how difficult this time of year is because her oldest son, Andrew, died on November 16, 1991 at the age of 15 in a car accident. Alina’s birthday follows close behind on December 12th. She posted quite a few pictures of their family, and received a lot of positive responses, supportive comments, and outpourings of love. Without a doubt, Marie deserves all of the support and compassion she could ever receive. I have no problem with that at all. But, in all honesty, it brought up feelings that I have had to deal with over the years – comparative grief and comparative loss. Because we were all part of the same homeschool group and the kids had a lot of friends in common, a lot of people knew about the death of Andrew and knew his family at that time. The Christianson’s had been a part of this particular homeschool group at the time Andrew died, while we had joined the group in 1995. Logically, a lot of support from that group when Alina died went to Alina’s parents and sister. Don’t misunderstand me – I am so very glad Marie has had support. Even Marie, years later when we went back to Seattle for a wedding, told me how much support she had when Alina died compared to when Andrew died. She told me she had support from local family, the homeschool group, her church, and friends. She also told me how true it is that, over the years, your address book changes as people get tired of your grief. I feel like I’ve talked ad nauseum about how alone we were after Jason’s death. It’s a fact, and I do not exaggerate. We had no geographically close family for support and almost non-existent support from anyone else. To say that we were so alone and it was so difficult is a gross understatement. It has changed us forever – physically, emotionally, spiritually. But, one of the things I’d like to discuss is this thing about comparative grief and comparative loss. Our family was treated as if our loss was the “lesser loss.” It wasn’t just the homeschool people rallying more (after the initial dropping off of meals) around Alina’s family and not ours. It was everywhere. I went to a Compassionate Friends group meeting for moms, trying to find some answers and support. They asked me if I wanted to introduce myself. When I said that our son and his best friend had died a few weeks ago, one gal told me, “Oh, you’re just a baby [in the grief process].” It felt very dismissive. But, then when I started talking about the accident, one gal interrupted and said that she had read the newspaper articles about the accident. Everyone started discussing how awful it was that Alina’s dad, Brian, had been on site when the accident happened, how awful it was that they had lost an earlier child in a car accident, that they had now experienced the death of a second child, on and on they went about how horrible it was for Alina’s family. All of a sudden, I was invisible, and my loss and my grief no longer “counted.” Comparatively speaking, the death of Jason, our grief, the loss of our son was the LESSER TRAGEDY. After discussing at length how horrible it must be for the Christianson’s, the discussion moved on to other things. My grief and loss no longer mattered, by comparison. I couldn’t wait to get out of there and never went back. The newspapers, intentionally or not, really jumped on the comparative bandwagon. They went for the sensationalism. Most articles talked about Brian witnessing the accident and about the Christianson’s tragedy of the second death of a child. One article, in particular, was so hard to read. Where the author talked about the accident and called both Brian and Alina by their first names, Jason was addressed as “Carney” through nearly the whole thing. The Bothell man continued on to Carney’s house but found neither Carney nor Alina, nor were they at Alina’s home. After the article came out in the paper, Marie called me to apologize for the tone of the article. Even coverage of the sentencing of the young man who killed Jason and Alina focused on the Christianson’s greater tragedy. It only briefly mentioned us or Jason. When we walked into the courtroom for the sentencing, the first two rows had been set aside for the Christianson family. I remember being given books written about the death of a child or people telling me about others who lost loved ones, as if I should count my blessings and be thankful I hadn’t suffered a greater loss. It is a tragedy – and adds to the already horrible tragedy – to make someone feel like their loss, their grief doesn’t matter. We do not have the right to invalidate someone else’s loss or grief. I don’t care whether it’s the death of Elvis or the people who died on 9/11 or the death of our precious Jason and his best friend Alina on 3/3/02. The loss of life is the loss of a life, and the people who dearly loved the ones who died DO NOT comparatively walk through lesser grief or comparatively feel a lesser loss. 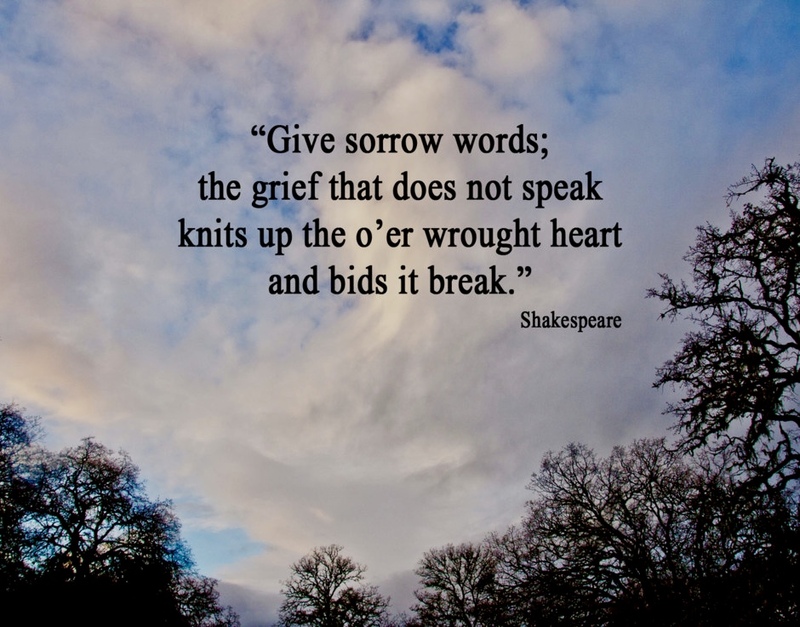 We invalidate the grief and loss by making the griever feel like they have experienced a lesser loss or that someone else has suffered a greater tragedy. It’s not fair. And it needs to stop. Everyone who suffered a deep loss needs to feel like their loss and their grief matters. Marie [Alina’s mom] called me this morning to apologize for how the Seattle Times article was presented. I told her it wasn’t her responsibility…and I meant that in the nicest way. She said someone needed to apologize to us. It was pretty much what I expected. From the beginning, media focus has been on the Christianson’s tragedy, the fact that Brian was at the scene, and that they lost a son in a car accident eleven years ago. If they mention Jason, they don’t even refer to him by his first name. He’s mentioned as “Carney,” the “driver” of the car, or “Alina’s friend.” It’s hard not to feel that Jason and the tragedy of his death has been either overshadowed or completely disappeared. Today’s Herald article was similar. They make it sound like the accident was Jason’s fault! I know it’s a huge tragedy for the Christiansons! There’s no doubt about it! But, don’t they realize that Jason’s death is such a huge tragedy, too? It has shattered our lives. Our lives – and we, right along with them – will never be the same. Oh, my precious boy! I miss you!!! How can you be gone? ?